Sir Martin Gilbert (born October 25, 1936 in London) is a British historian and biographer and author of over seventy books on a range of historical subjects. He is primarily known as the official biographer of Sir Winston Churchill, British Prime Minister during World War II. He studied modern history at Magdalen College, Oxford, graduating in 1960 with a BA. He was knighted in 1995 for services to British history and international relations. An Honorary Fellow of Merton College, Oxford University, he lives in London and since 2002 has been a Distinguished Fellow of Hillsdale College, Michigan. In this Atlas, I trace the history of Jerusalem from biblical times to the present day. Each map is illustrated by a facing page of prints or photographs. 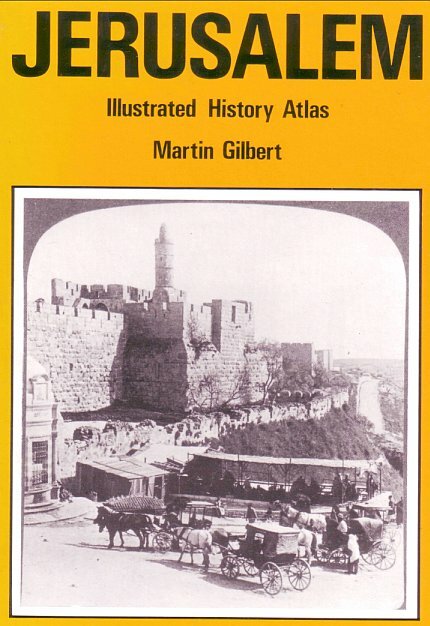 The sixty-six maps, taken together, are intended to provide a broad survey of Jerusalem's history, with special emphasis on the City's development during the last hundred and f i f ty years, when it grew from a remote and impoverished provincial town of the Ottoman Empire, with a population of less than 40,000, to a capital city with a population of more than 360,000. In the bibliography, beginning on page 124, I have listed those maps, atlases, guide books, travellers' tales and historical works which I consulted while preparing the maps, and on which I drew for the contemporary material which they contained for each decade of the city's history.